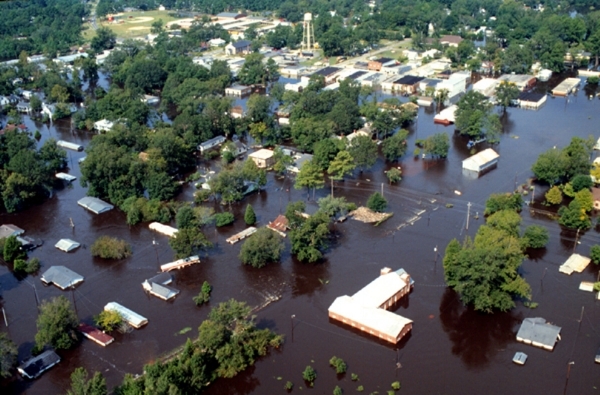 The city of Kinston, North Carolina was struck by two devastating hurricanes in a relatively short period (Hurricane Fran in September 1996 and Hurricane Floyd in September 1999). To protect human life and prevent future property damage, city planners utilized FEMA HMGP (Hazard Mitigation Grant Program) funds to carry out voluntary buyouts of flooded properties and provide residents with money to move to safer areas of the community. Aerial photograph of inland flooding caused by Hurricane Floyd. Photo by J. Jordan, U.S. Army Corps of Engineers. When Hurricane Fran hit in 1996, a number of properties were damaged. An acquisition program was started with HMGP funds to purchase substantially damaged homes. Only three years later, Hurricane Floyd struck the area causing widespread damage. This second storm not only motivated more residents to participate in the acquisition program, but also allowed for a large portion of the Fran-recovery program to be rolled over to begin including Floyd victims, eliminating the typically long lapse time between a disaster and completing deed transactions. The 100 acquired properties were turned into greenspace. New affordable housing was built on vacant lots downtown to provide residents with a safe place to live without having to leave the community. Anticipating some public pushback and wanting to move the acquisition process along as quickly as possible, planners from the city of Kinston began conducting property damage assessments as soon as it was safe to enter the flooded neighborhoods after Hurricane Floyd. Planners utilized declarations of “substantial damage” and “public health threat” on severely damaged properties along with a building moratorium in flooded neighborhoods to help push along the acquisition and relocation agenda. Housing counselors worked with residents to help them understand the risks of staying in a high-risk area and the advantages of taking a buyout. The program costs approximately $2.1 million, with 75% coming from FEMA from the HMGP and 25% from the state. Although the funding for buyouts was coming from the HMGP, Kinston had much more flexibility in its buyouts because the city advanced the funds and was later reimbursed by FEMA. In 2005, the city received a Clean Water Management Trust Fund grant to buy out additional vacant lots who’s owners did not accept a buyout after Floyd. Kinston had a high rate (97%) of participation in the acquisition program following Hurricane Floyd. Acquisitions have prevented the need for future expensive disaster recovery efforts in the city’s floodplain neighborhoods. Total losses avoided by the acquisition program exceeds $6 million. McCann, M. O. (2006). Case study of floodplain acquisition/relocation project in Kinston, NC after Hurricane Fran (1996) and Hurricane Floyd (1999). (Master’s thesis, University of North Carolina Chapel Hill).